Spinal Stenosis: part of spine narrows and pinches a nerve(s); results in numbness and/or pain in other parts of the body. Pain, tingling, weakness and instability - all these can result from stenosis, a narrowing of the canal in the vertebrae that can pinch and damage the spinal cord. Spinal Stenosis is a condition that refers to narrowing of the spinal canal, typically caused by age and degeneration of intervertebral discs and facet joints. Arthritis is the most common cause of Spinal Stenosis, as it causes facet joints to expand, leaving little room for nerve roots. As the disc degenerates, they dry out and weaken, reducing in height. The load on the vertebrae shifts, putting more demand on the facet joints. The facet joints can weaken and inflame, causing the openings to shrink and press on nerves. Bone spurs may also develop and grow into the spinal canal. Ligaments around the joints can also increase in size, causing additional irritation and pressure on nerves. Back Pain - This may or may not occur and many people with Spinal Stenosis feel pain in their extremities rather than in their back. This is known as "referred" pain. Numbness/Tingling - The pressure on nerves may cause sensations in extremities that feels like an electric current or a lack of sensation in touch. Burning/Aching Pain - Nerve pressure can cause a radiating pain down the extremities. This is often referred to as sciatica. This pain can extend its reach based on location of degenerative condition. Weakness/Instability - As pressure on nerves increase, the extremities can lose strength and ability to maintain grip or balance. Lumbar Spinal Stenosis can cause "foot drop," where the patient's foot drops or drags while walking. Decreased Pain in Sitting Position - Leaning forward while sitting can cause the stenosis to temporarily shift itself back into a more normal position that opens the nerve space, providing relief. Standing and walking causes more pain than sitting in stenotic conditions. Your doctor may perform tests on you to determine if you have Spinal Stenosis, and how severe it is. These tests may include patient history, X-rays and MRIs to get background and images of your spine. Additional tests may include CT scans and myelograms to determine where the condition is occurring and if nerves are being compressed. 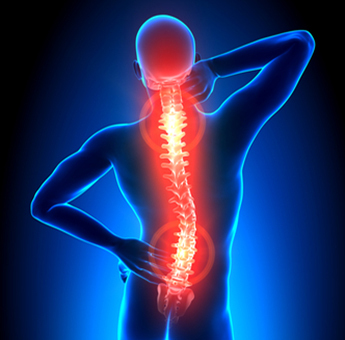 Treatment for Spinal Stenosis ranges from conservative to surgical. Your doctor will work with you to develop the most effective treatment path. Non-surgical options include physical therapy, lumbar stabilization and traction devices, anti-inflammatory medications, steroidal injections and/or other non-surgical treatments. Surgical options range and are decompressive in nature. The surgical options depend on severity of condition and may or may not include discectomy, or removal of damaged disc. Discuss your options with your doctor.